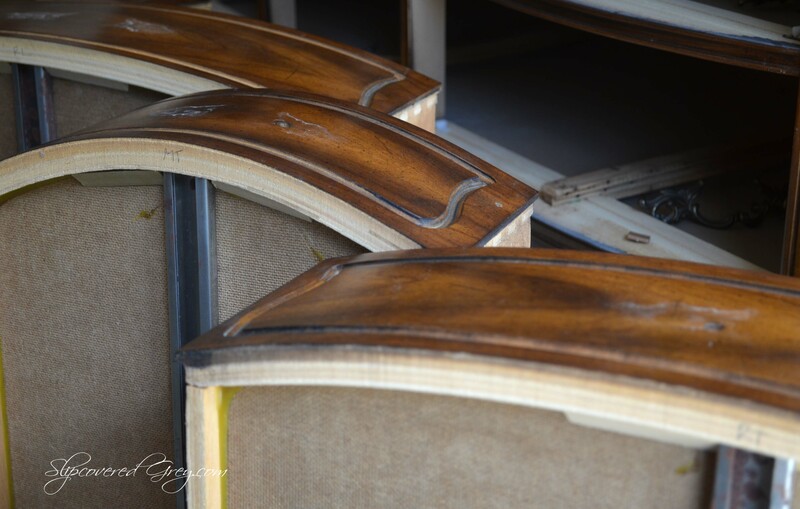 There is always excitement when buying a new piece of furniture to refinish. Sometimes I get so excited to jump right into the project without organizing a plan first. I forget to take before pictures and think things through before I start. That’s when I have to slow down and stop. If I don’t, drawers won’t fit, hardware doesn’t screw back in, and this is where frustration sets in. I have a system now that works for me and hopefully will work for you to help you stay organized when painting a dresser or large piece. 1. BEFORE PICTURE… When you arrive home with your new piece, immediately take a before picture. It’s nice to take a look at the before picture and compare it with the after. This will help you celebrate your success when you are finished. 2. GATHER STARTING SUPPLIES… Starting supplies are not the most exciting. Vacuum for cleaning dust bunnies and surface dirt. 3. LABEL, LABEL, LABEL… Take out drawers one by one and label them. 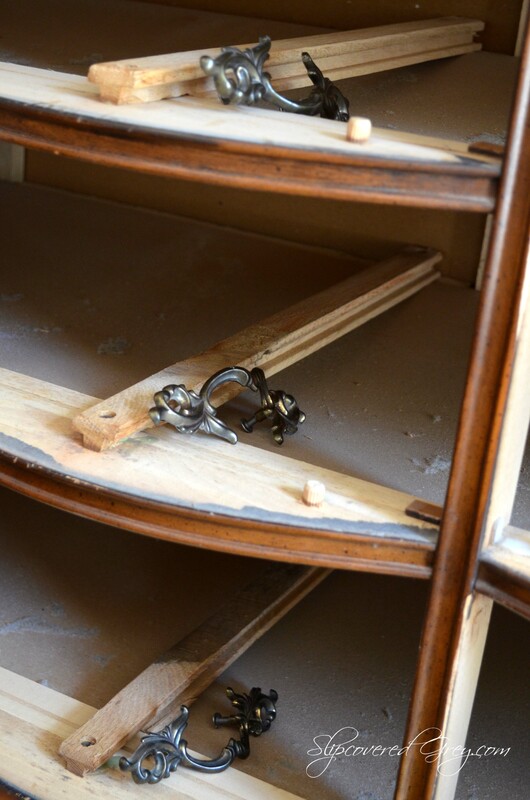 Divide the dresser into sections. The dresser above has three sections. It has a left, middle, and right section. With a pencil label the bottom of the drawers with a system that works for you. 4. ORGANIZE HARDWARE… Remove hardware and place in the dresser to keep the original hardware with the corresponding drawers. Look at the hardware above… screwing the screws back into the drawer pulls keeps them organized and with the original hardware. See the dust bunnies? Yuck! 5. SURFACE PREP… It’s time to vacuum dust bunnies and surface dirt. After vacuuming, you are ready for cleaning. Then you are ready to prime and/or paint your furniture. I hope my organizing tips help. They sure have helped me! Do you have any tips you would like to share? I would love to hear them. 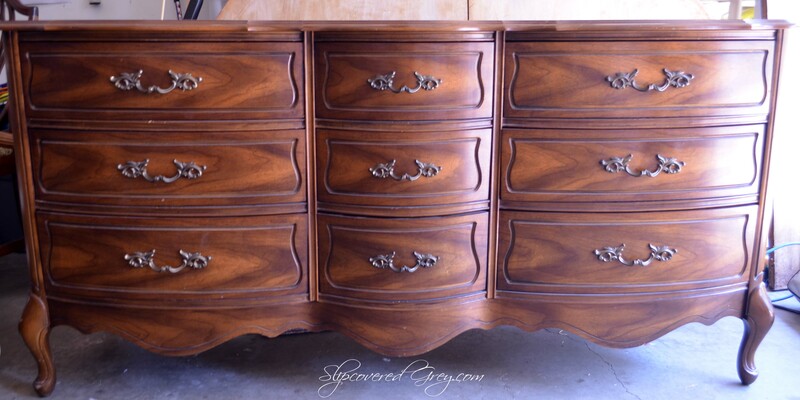 My next post will show you the AFTER painted dresser. See you then. Tags: Organize Before Painting Painting Prep. Great tips! Organization is always a challenge and your tips really help! Can’t wait to see this amazing piece completed! This is one of may favorite pieces! I love the French design!